Citizens’ Action Group: What can we do about homelessness together? Envelope used in the mail-out to create the Citizens' Action Group. Design: Europa. 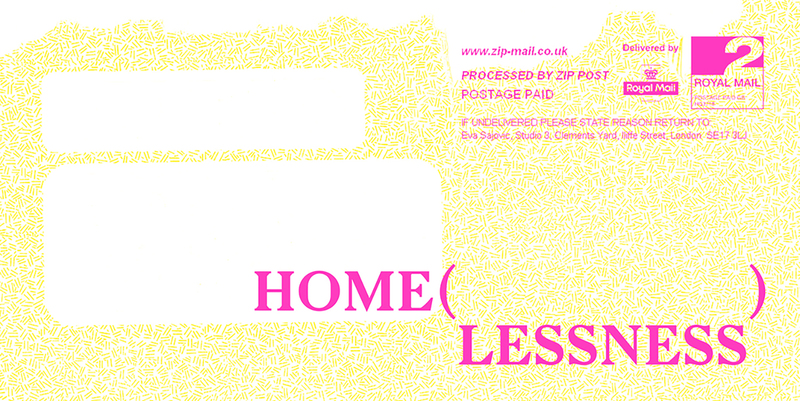 Home(lessness): Southwark Citizens for Spatial Justice is the first stage of a three-part project addressing the urgent state of homelessness in the borough of Southwark. The project was initiated by a process of Sortition, a system used by the Ancient Greeks to elect political decision makers, with 1000 invitation letters sent to local people selected at random by postcode. From the respondents, a representative group have been invited to attend five meetings at the SLG to be briefed by experts on the key issues facing the homeless community. These include access to healthcare, affordable housing, immigration status and access to services that provide support. At the end of each session the group spent time together collaborating on a tapestry, learning weaving techniques and sharing skills. During this part of the session the group reflected on which issue to take forward for further research, and then a future campaign in 2020. You are invited to join group facilitators Eva Sajovic and Amy McDonnell and some members of the Citizens’ Action Group in their final session to hear more about what the group have discussed over the past five weeks and to engage with the next stage of the project. There will also be the opportunity to learn weaving techniques with the group. Amy McDonnell is a curator and researcher whose practice engages with contemporary themes of collectivity, collaborative exhibition making and political participation. McDonnell completed a PhD at Chelsea College of Arts in 2017 and she has recently been working as a Parliamentary Assistant at the European Parliament. Eva Sajovic is a socially engaged artist photographer. In her work Sajovic explores the drivers of global displacement such as regeneration, poverty, trafficking, culture and climate change. Her practice covers two strands: participatory social action projects and photographic social portraiture produced in collaboration with the subject. Supported by The Westminster Law & Theory Lab, University of Westminster and The Sortition Foundation.